Home medical equipment allows mesothelioma patients to continue living at home during their cancer treatment. Medicare can cover the cost of renting or purchasing many types of durable medical equipment. Mesothelioma patients often rely on durable medical equipment in order to continue living at home safely and comfortably during their cancer treatment. Because the symptoms of mesothelioma include shortness of breath, pain caused by fluid buildup, weakness and fatigue, these symptoms may interfere with a patient’s activities of daily living, and at their most severe, symptoms can be life threatening. 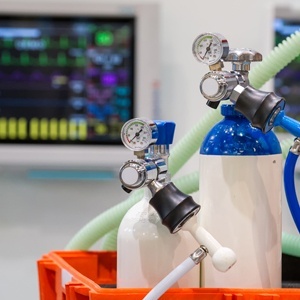 Some types of home medical equipment, such as oxygen tanks and indwelling catheters, are specifically prescribed by doctors to alleviate the symptoms caused by mesothelioma. Caregivers may also obtain other types of equipment, such as hospital beds and wheelchairs, to help patients rest better and move around in their homes and neighborhoods. The purpose of all home medical equipment is to provide a better quality of life. Some types of equipment can be rented from medical supply stores or hospital facilities, while other types must be purchased. Insurance may cover some or all of the cost. Talking to people in a mesothelioma support group who have experience with home medical equipment is a great way to get information and recommendations. Home medical equipment can add substantially to the cost of cancer treatment. Fortunately, durable medical equipment that is reusable — such as oxygen equipment, hospital beds, wheelchairs and walkers — is generally covered by Medicare Part B, and Original Medicare may cover the cost of equipment a doctor deems medically necessary. Typically, a Medicare beneficiary is responsible for 20 percent of the cost of equipment. Make sure to contact Medicare directly if you have questions regarding coverage and the cost of specific equipment. Pleural mesothelioma develops in the lining around the lungs, and it accounts for the majority of all mesothelioma cases. Pleural mesothelioma patients usually suffer from a buildup of fluid in the pleural lining that can cause breathing difficulties and chest pain. The spread of late-stage cancer into the lungs can cause these symptoms as well. 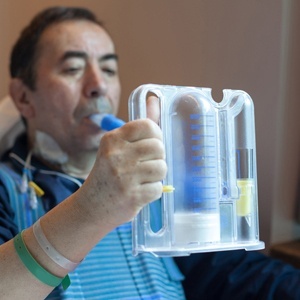 A portable oxygen tank delivers oxygen to a patient through a flexible tube with two prongs that are inserted into the nose. Portable oxygen tanks come in a variety of sizes, with smaller ones available when patients need to travel or want to enjoy the outdoors. Because oxygen is flammable, be sure to keep tanks away from heat and open flames. To prevent infection, the equipment should be washed with a mild detergent and sanitized with a solution of one part vinegar to three parts distilled water. Oxygen tanks are generally not allowed on airplanes. An FAA-approved portable oxygen concentrator must be used instead. To ease discomfort and make it easier for late-stage mesothelioma patients to breathe, the doctor may prescribe the use of a mechanical ventilator, also called a respirator or breathing machine. The patient is connected to the ventilator through a tube that is placed into the mouth or nose and connects with the trachea (or windpipe). 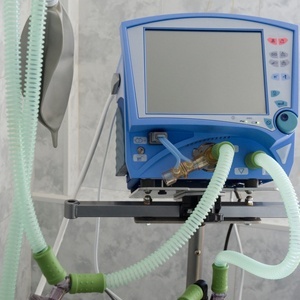 The ventilator blows a mixture of air and oxygen into a patient’s lungs. Caregivers must be sure to use the ventilator properly to avoid causing lung damage or pneumonia. It is important for patients with mesothelioma to monitor their lung function. One way to do this is by using a spirometer, which typically consists of a mouthpiece, tubing and a recording device. The spirometer measures the volume of air inhaled and exhaled and the length of time each breath takes. These measurements can tell doctors about the health of a person’s lungs. Most spirometry tests are done in a doctor’s office, but in recent years new spirometers have become available that make it easier to take measurements at home. Digital spirometers allow patients to test their lung function when convenient and upload the results to a computer for easy sharing with their doctor. Surrounding yourself with family and friends at home can ease the stress of living with mesothelioma. Medical equipment that sustains daily lifestyle needs can help patients avoid unnecessary strain on their body. Many items fall under Medicare’s durable medical equipment category. Before purchasing or renting a piece of home care equipment, check its eligibility and have your doctor fill out and send a Certificate of Medical Necessity to Medicare. Hospital beds are available for patients who are receiving care at home. The adjustable frame can help patients sit up on their own, and the railings can prevent accidental falls. If a patient is using a ventilator or oxygen tank, the size and shape of the bed can also make it easy to have these items nearby. Hospital beds can be expensive, but most insurance companies cover their cost, and patients have the option to rent rather than purchase a bed. 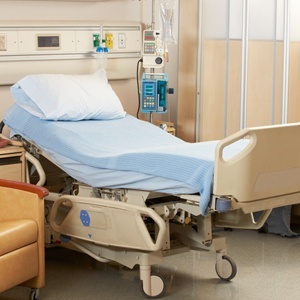 When using hospital beds, the U.S. Food and Drug Administration recommends checking the motors for dust and debris and checking for the proper fitting of the bed frame, mattress, rails and any other accessories. Some mesothelioma patients who suffer from difficulty breathing may need a mobility aid such as a wheelchair. When using a wheelchair, it is important to always read the operating manual and take proper precautions to avoid injury. Keeping your wheelchair in good repair. Always locking the brakes before getting out. Lifting footplates up before getting in or out of the chair. Not putting heavy objects on the back of the wheelchair, as this may cause the chair to tip backwards. Keeping loose objects away from wheels and spokes. Using a flag or reflectors if you ride outdoors. Adjusting the speed of your wheelchair to a manageable level. Some patients may have difficulty standing in the shower for long periods of time. Shower chairs are made of waterproof material and provide a safe and comfortable alternative to standing in a shower. Some shower chairs also have safety bars to keep patients from falling out. However, many shower chairs are designed to be used in walk-in showers only, so be sure you obtain the right type of equipment. If the chair has wheels, always make sure the wheels are locked before sitting on it. Clean the chair after every use with a sanitizer or a solution of one part bleach to 10 parts water. 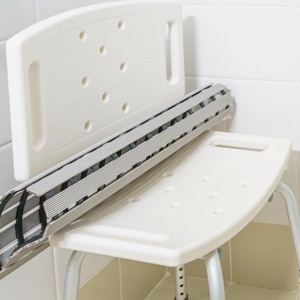 In addition to a shower chair, consider installing other bathroom accessibility equipment such as bathtub safety rails, nonslip strips, a hand-held shower hose and a toilet frame. 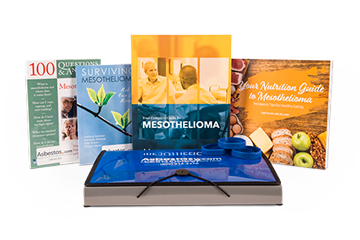 Information on mesothelioma, treatment and nutrition to share with patients plus caregiver tips. Pleural mesothelioma patients often suffer from pleural effusions, an accumulation of fluid in the lining of the lungs that causes difficulty breathing and chest pain. Patients who suffer from peritoneal mesothelioma will often develop ascites, a buildup of fluid in the abdomen that causes difficulty breathing, loss of appetite and abdominal pain. Mesothelioma-related fluid buildup often reoccurs, which can lead to repeated trips to the hospital for invasive procedures to drain the excess fluid. To better manage this condition and minimize hospital stays, doctors may instead insert a catheter or shunt to drain excess fluid on an ongoing basis. A catheter is a flexible tube that is surgically inserted into the pleural or peritoneal cavity to drain excess fluid into a glass vacuum bottle outside the body. Specialists typically recommend an indwelling pleural catheter (IPC) in cases where treating pleural effusions through a pleurodesis procedure is not feasible. This type of pleural effusion or ascites treatment reduces hospital stays and provides effective management of symptoms. Patients can drain fluid at home with a nurse or during outpatient appointments, eliminating the need for additional palliative surgery. A pleuroperitoneal shunt is a tube that allows pleural fluid to drain into the abdomen, where it is more likely to be reabsorbed by the body. The tube runs through a manually operated pump located just beneath the patient’s skin. This type of shunt is no longer widely used for pleural mesothelioma patients because of the risk of cancer cells traveling through the shunt and causing tumors to grow elsewhere in the body, which is called tumor seeding. A PV shunt, also known as a Denver shunt, is a tube that drains peritoneal fluid from the abdomen and reinfuses it into the bloodstream through a vein. The shunt typically has a pressure-sensitive valve, which opens when fluid pressure is greater than 1 cc of water. This type of shunt also creates a risk of tumor seeding and is no longer widely used for peritoneal mesothelioma patients. American Thoracic Society. (2017). Mechanical ventilation. Stoller, J. (2016, October 3). Patient education: Supplemental oxygen on commercial airlines (Beyond the Basics). Centers for Medicaid and Medicare Services. (2016, September). Medicare coverage of durable medical equipment and other devices. American Cancer Society. (2016, February 17). Palliative Procedures for Malignant Mesothelioma. Sangisetty, S., and Miner, T. (2012, April 27). Malignant ascites: A review of prognostic factors, pathophysiology and therapeutic measures. Schrader, J., and Ferson, P. (2009, May). Managing recurrent pleural effusions with an indwelling pleural catheter. Little, A. et al. (1988, October). Pleuro-peritoneal shunting. Alternative therapy for pleural effusions. Lechtzin, N. (n.d.). Overview of Tests for Lung Disorders. Nemours. (n.d.). Managing home health care.